The Micro.Mini Beautyblender eliminates brush marks and gives concealer an airbrushed, flawless finish. I am a huge fan of the Original Beautyblender, reviewed here, and consider it my HG makeup applicator for liquid and powder foundations. Both the Black and Pink versions, compared here, give a flawless, cake- and mark-free finish. However, I used to reach for a brush for applying concealer and, on busy mornings, I have wished for a brush-mark-free, easily blendable application method, particularly with thick concealers. Recently, the Beautyblender brand released a Micro.Mini version of the cult sponge, for precision application of foundation, concealer and other makeup. The fluorescent green Micro.Mini sponges are cute and "squeezable" - at the risk of being labelled weird(er than I already am), squeezing these is as stress-busting as bursting bubblewrap. 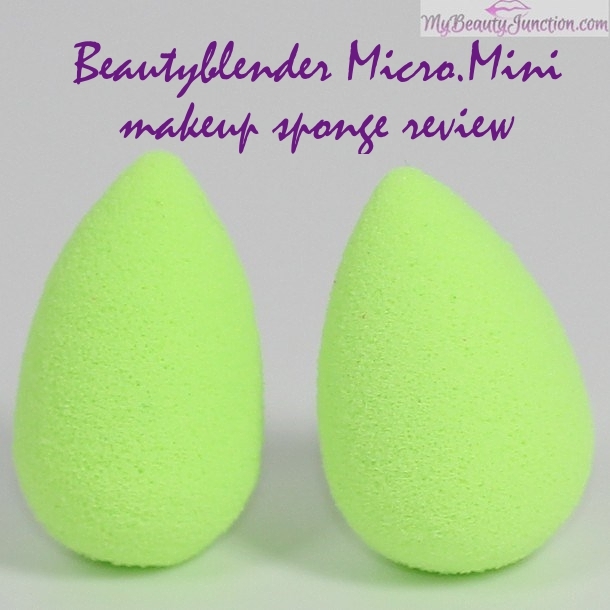 Read on for the full review of the Beautyblender Micro.Mini sponges. 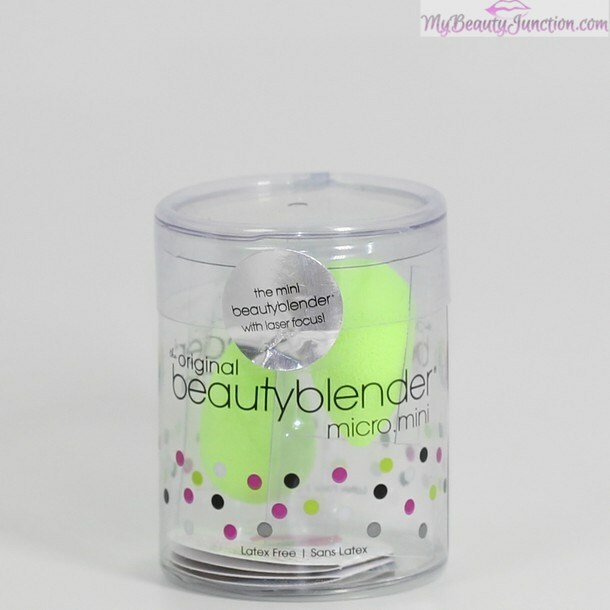 The Micro.Mini Beautyblender sponge is fluorescent green and comes in the smaller version of the Original Beautyblender's clear plastic packaging. There are two sponges per package. Just like the Original Beautyblender, the Micro.Mini version also expands when wet. To the right, you can see the dry sponge, and to the left is the expanded wet sponge, after the water was squeezed out. These are best used damp - dry sponges don't give as flawless a finish. The Micro.Mini sponges are softer, less dense and about four times smaller than the original Beautyblender - check out the size comparison below. Also, being softer and smaller than the Beautyblender, the Micro.Minis are easier to manipulate and navigate into all those nooks and crannies on the face. They give a sheerer finish than the denser Beautyblender but coverage is buildable. The Micro.Mini Beautyblenders are ideal for applying concealer, primer and cream eyeshadow around the eye area and makeup in hard-to-reach areas such as the sides of the nose. You can apply concealer directly to the sponge and then to the skin, or, as I do, apply some concealer to the back of the hand and pick it up to the sponge. The rounder portion of the sponge is good for the under-eye area whereas the pointed end is excellent for inner corners. It is super-soft and flexible and requires minimal effort. 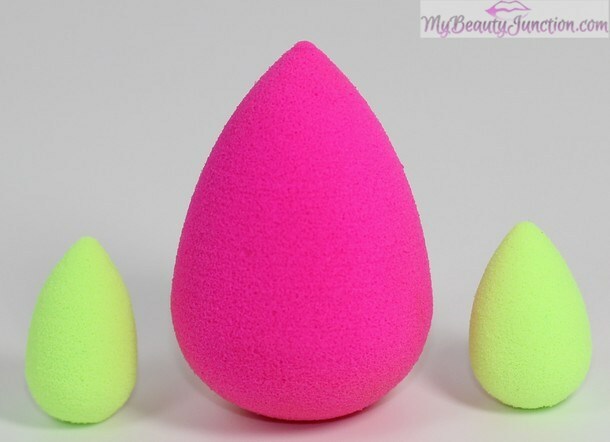 Just like with the Beautyblender, the wet Micro.Mini also needs to be "bounced" on the face to deposit the product. Because of the bouncing method, it covers more area quickly. Like the Original Pink Beautyblender, the Micro.Mini has stained over two months' use, and the stain has not completely gone away despite using the Blender Cleanser and proper makeup removers. This is why I love the Black version of the Beautyblender and wish the Micro.Minis came in deeper colours. Unlike the Pink Beautyblender, the Micro.Minis have not had the colour run so far. Thank goodness. So why do you NEED the Micro.Mini Beautyblender? For the finish. Here is IT Cosmetics Bye Bye Under Eye Concealer in Tan (reviewed here), applied with the Micro.Mini Beautyblender to the left (just to the right of the number 1), and with the Sephora 57 Airbrush Concealer Brush to the right of number 2. I have used equal amounts of concealer for both swatches and put in exactly the same effort in blending both out (about 10 seconds). Photo taken in direct sunlight. You can see that the finish is more natural, skin-like and airbrushed to the left (1), whereas the second swatch is, well, more visible. I have to try applying eyeshadow with the Micro.Mini Beautyblender, but the possibility of staining is putting me off. You can get a mark-free finish with a good concealer brush, but the same finish requires less effort with the Micro.Mini Beautyblender. These super-cute sponges make it a lot easier to blend in concealer or even foundation. Remember, like the Beautyblender, the Micro.Minis are better used when damp, with the water squeezed out. If you are hard-pressed for time and want to step out with perfectly blended concealer, the Micro.Mini is a must-have in your stash. I give it Holy Grail status and now use brushes only for eyeshadows. To nitpick, I wish these came in other colours, such as chocolate brown or deep purple and teal green, which would help avoid visible stains. The Micro.Mini Beautyblender is available wherever the original version is sold, in Sephora, Beauty.com or Amazon, as well as Beauty Bay in the UK, though it is out of stock in the latter at the moment. The pack of two Micro.Minis is $17.95, which is a great deal when you compare it to a good concealer brush.